DETROIT, Jan. 22, 2018 – Two of the most iconic American performance cars, a current generation Ford GT and the recently unveiled 2019 Mustang BULLITT, raised a total of $2.85 million for charity during the 47th Annual Barrett-Jackson Scottsdale Auction. On Saturday, a 2017 Ford GT that was donated by businessman Ron Pratte to the Evernham Family-Racing for a Reason Foundation, sold for $2.5 million to benefit Autism Society of North Carolina. 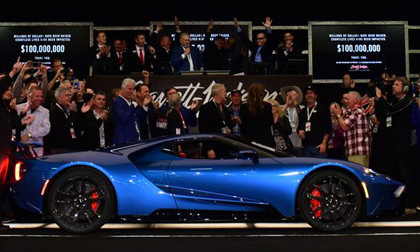 Mr. Pratte donated an additional $50,000 to the sale of the Ford GT to benefit the Autism Alliance of Michigan, bringing the total dollars raised to $2.55 million. On Friday, Ford and the McQueen estate donated VIN 001 of the limited-edition Mustang BULLITT (Lot #3006), with 100 percent of the $300,000 hammer price benefiting Boys Republic. One of Ford Performance’s vehicles made history during this year’s Scottsdale Auction. A 2017 Ford GT (Lot #3010) which hammered in at $2.5 million, became the first current-generation GT donated for charity. One hundred percent of the hammer price from the sale of the Ford GT will benefit the Autism Society of North Carolina’s IGNITE program. Ron Pratte, the Arizona businessman, entrepreneur and car collector who generously donated the Ford supercar to the Evernham Family-Racing for a Reason Foundation, donated an additional $50,000 to benefit the Autism Alliance of Michigan, who works to make Michigan a better place to live for people with autism and their families. Ford also included a Ford Performance Racing School GT Experience with the auction of the Ford GT. This world-class program gives the winning bidder the chance to improve their driving skills behind the wheel of one of the world’s most celebrated supercars, while also supporting individuals with autism. Greg Miller, part owner and member on the Board of Directors of the Larry H. Miller Group of Companies, purchased the Ford GT to be a part of the family’s car collection. Ford and the McQueen estate offered VIN 001 of the 2019 Mustang BULLITT to benefit Boys Republic, a private, nonprofit, nonsectarian school and treatment community for troubled youngsters. One-hundred percent of the $300,000 hammer price will go to the organization to help children find the resources and skills to build meaningful lives on their own. The all new 2019 Mustang BULLITT (Lot #3006) made its debut earlier this week at the North American International Auto Show. A prototype was shipped to Scottsdale where it was driven on the Barrett-Jackson block by Chad McQueen, the son of Hollywood star Steve McQueen. In addition to the current generation Ford GT 2019 and Ford Mustang BULLITT, Ford had an incredible presence during the Barrett-Jackson Auction. Vehicles displayed included Ford’s performance icons, the all-new Raptor, the Shelby GT350, the Ford GT, Focus RS and the powerful new 2018 Ford Mustang GT, as well as the Ford F-250 Super Duty, Motor Trend’s Truck of the Year. Two vehicles were also unveiled by Ford during the North American International Auto Show; both were then introduced at Barrett-Jackson. One was the 2019 Mustang BULLITT and the other was the exciting new Edge ST crossover. Boys Republic is a private, nonprofit, nonsectarian school and treatment community for troubled youngsters based in Chino Hills, California. Since its founding in 1907, it has guided more than 30,000 at-risk teenage boys and girls toward productive, fulfilling lives. Boys Republic, and its companion program, Girls Republic, seek to give adolescent youth with behavioral, educational, and emotional difficulties an opportunity to achieve their maximum potential for responsible, self-directed life within the community.